Hussen floats ideas to modernize Safe Third Country Agreement with U.S.
Immigration Minister Ahmed Hussen says he's approached American government with ideas for modernizing a 14-year-old agreement on refugee claimants who attempt to cross the border between Canada and the United States. Immigration Minister Ahmed Hussen says he has approached the American government with ideas for modernizing a 14-year-old agreement on refugee claimants who attempt to cross the border between Canada and the United States. One idea he is floating is to use biometrics to allow border officials to better track the movements of individuals at official ports of entry to determine if they are eligible to make a refugee claim in Canada. "When the agreement first came into force, the agreement was predicated on line-of-sight," Hussen told The Canadian Press on Tuesday. "You could return someone back to the U.S. or the U.S. could return someone back to Canada if they're crossing at an official port of entry and you can see they're coming from the other side,". 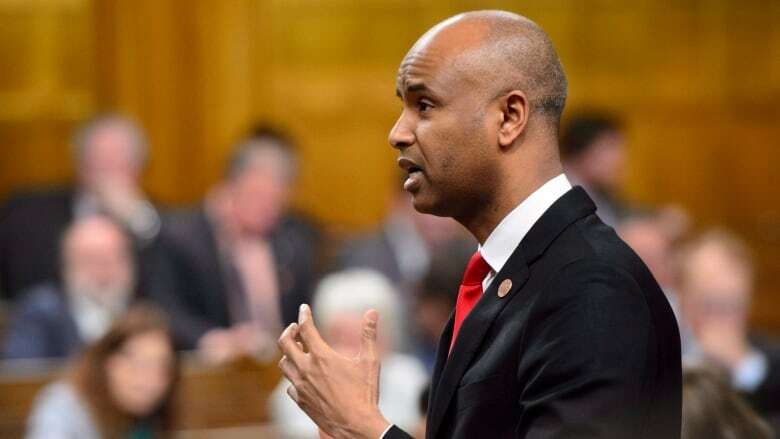 Hussen says new technologies like biometrics could give greater enforcement powers to border security officers and help modernize the agreement. "Now it's easier to establish 'country of first presence' without the need of line-of-sight. You can do that with biometrics, you can do that other ways, so the agreement could incorporate those new developments," Hussen said. This is one of several ideas he has floated to the United States government as a means to modernize the safe third country agreement. But this change would do nothing to stop the flow of irregular migrants coming to Canada through unofficial entry points like the one at Saint-Bernard-de-Lacolle, Que., since the safe third country agreement does not apply at non-official border crossings, said Conservative Immigration critic Michelle Rempel. That's why the government needs to fully renegotiate the agreement or apply it to the full length of the border, she said. She and other MPs questioned Hussen and Public Safety Minister Ralph Goodale on Tuesday at a meeting of the Commons immigration committee, where exchanges between the ministers and Opposition members often became testy. Rempel said she is frustrated at the lack of details provided by the ministers to questions on the numbers of individuals who have been removed from the country after illegally claiming refugee status by crossing the border irregularly. "I suspect that number is exceptionally low... there's no way (Goodale) doesn't have that number," Rempel said. "I think it's because their plan isn't working and they don't want to be held accountable by Parliament or by the Canadian people and that's why they're withholding this data." Both Hussen and Goodale promised to table the information requested by Rempel in the coming days. NDP immigration critic Jenny Kwan was also visibly frustrated as she questioned the two ministers, repeatedly asking what they have done in their discussions with the U.S. to address what she says is the "core of the issue," which she believes is President Donald Trump. "Every time the president utters or tweets some anti-immigrant, anti-immigrant rhetoric, it creates a situation and there's a reaction to that," Kwan said. "I think it's fair to say since the Trump administration formed office there's been a significant change with respect to asylum seekers crossing over to Canada irregularly and we have seen the numbers spike and continue to go up." Goodale disputed this, however, saying the initial increase in irregular border crossers to Canada began before Trump was elected. Changes to the temporary protected status of many immigrants living in the U.S. could have had an impact on the border however, Goodale conceded. Meanwhile, discussions on modernizing the safe third country agreement are still in their early days, Hussen said. He is planning a trip in the coming days to meet his counterpart in Homeland Security to discuss the situation further. "We've made our feelings known to the United States and we now have to wait for them to respond in whatever way they are going to respond."